Buried treasure in Arkansas exist throughout the State. Arkansas is well know for hidden treasures. During the 1800's, the KGC (Knights of the Golden Circle), as well as the outlaw Jessie James, were known to have buried many treasures within Arkansas. Also, this State is well known for it's gold, silver and diamond mines. Many of these mines are lost mines due to collapsed entrances caused by both man and nature. Here are six areas to search for treasures of every kind in Arkansas. But before you head out to search, be sure you have more information than what I am providing you with here. The experienced treasure hunters always arm themselves with as much knowledge about a treasure as they can find. Do not take a brief story about a buried treasure as the truth. Stories change as they are told over and over. Research the story further. A good place to start is on the Internet. Also check with the historical societies of the areas you will be searching in. If you have a chance to visit the archives in Washington, it’s a great experience, and they have many reference books, and items like old maps, and newspapers. 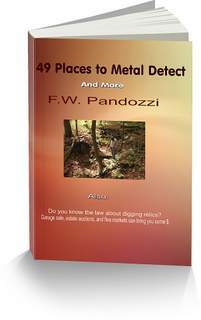 A metal detector is a useful tool to use when searching for buried treasure in Arkansas. If you are thinking about purchasing one don’t spend a lot of money. You can buy a good detector for between $350-$450. If you study the owners manual, and practice, you will find many items. If you plan on heading into rough terrain be sure to be prepared by carrying survival gear and a topographic map. Here is information regarding topo’s. Jessie James the outlaw, and a possible member of the secret organization the “Knights of the Golden Circle“, KGC. supposedly buried thousands in gold in the Brushy Mountains between Hot Springs and Plainview. The treasure was stolen from the Hot Springs stagecoach. The Hen Wesson Treasure - A very well to do businessman, Hen Wesson, supposedly buried a fortune accumulated over forty years. Rumors say that the buried treasure is located on the west bank of the Arkansas River, near route 40, approximately five miles southwest of Conway. The Hermann Family Treasure - Five, large, ceramic jugs holding gold coins, were buried by the Hermann family during the Civil War. They were buried in separate locations at their farm which was located at Dutch Mills. At the end of the war three of the jugs were found. The Hernando De Soto Treasure - The Spanish explorer Hernando De Soto buried a treasure of gold somewhere along the Quachita River, near Arkedelphia. The gold was taken from the Indians. The Claredon Treasure - During the Civil War a Union gunboat sank while on patrol in the White River. It sank near Claredon. The boat was carrying $150,000 in gold coins. A few years after the sinking, the gold was recovered by John Crittenhouse. Soon after, the government found out that Crittenhouse had removed the treasure from the river, and demanded it be returned. Crittenhouse then hid the gold in a cave near Claredon. Not long after caching the gold, Crittenhouse died, never revealing the location of the cave. The Flynn Farm Treasure - $115,000 in gold coins is rumored to be buried on the William Flynn farm. The farm was located on county route 45, a few miles east of Fayetteville. The coins were said to be buried in 1897 by the grandfather of the family. Anytime you are going on to private property be sure to ask for permission. If you are venturing on to State or Federal lands to search for buried treasure in Arkansas, you should know the laws of that State. Have fun in your search for buried treasure in Arkansas. Buried treasure in Arkansas may be located in ghost towns. My Special Bundle package of eBooks.